After a wonderful 2.5 weeks in Italy and France, I come back to you with a renewed love for all things Italian and a higher standard for "good" Italian food. While I'm slightly ashamed that I didn't follow through with my initial intent of "live-blogging" this trip, I now have a much more holistic look on all the meals I had in my travels through Rome, Venice, Florence and Cinque Terre since I can objectively compare them all now. Since we didn't have time to do a lot of research about food in Italy prior to the trip (damn you crazy work schedule! ), J and I ended up finding good eats via recommendations from friends and reading a ton of reviews on Yelp & Trip Advisor during the trip. With a lot of day-of research and a bit of luck, we managed to find awesome food most of the time while being tricked into a few terrible tourist traps here and there. 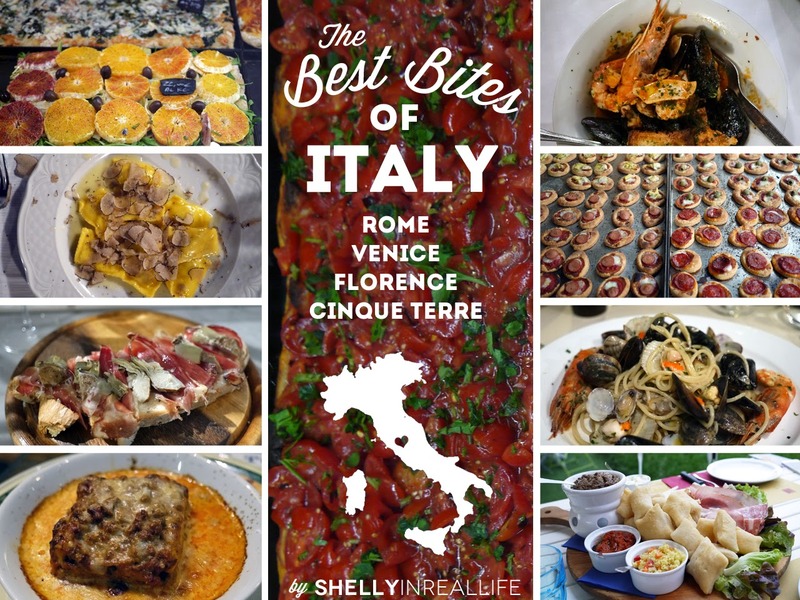 To keep it simple, I'm going to start a series for The Best Bites of Italy so that I can share some of our most memorable meals from this trip. The food I'm going to feature is food that I can only dream about eating while being back home. 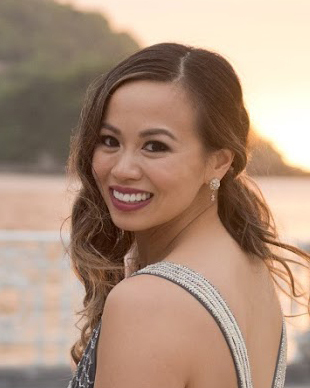 This list going to be in chronological order since I don't want to rank one experience over another - they are unique in their own way! My trip started off in Rome, so let's start off there! 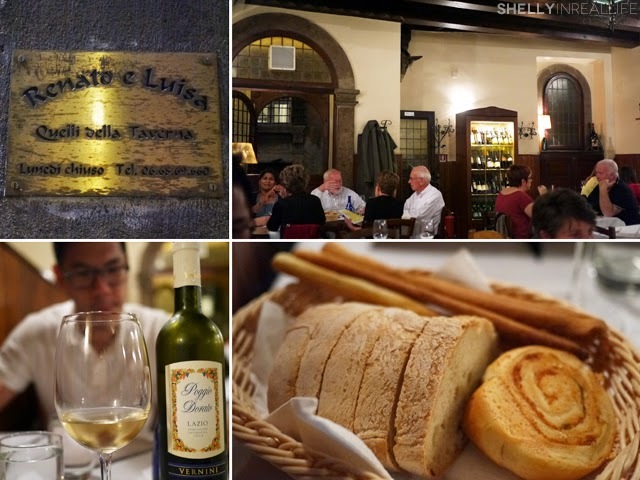 The recommendation for Renato e Luisa came to me by a friend who had been in Rome just a few weeks prior. Luckily, the restaurant is only a short 10 minute walk away from our Airbnb apartment in Campo di Fiori. We called to get a dinner reservation the day of and was lucky to get a seat at 8:30pm (when they opened), which is still pretty early for Roman standards. Italy Travel Tip #2: You can't go wrong with a bottle of the vino della casa, the house wine is always solid and cheap! A bottle tonight was only €9! Note: I'm not a wine connoisseur. 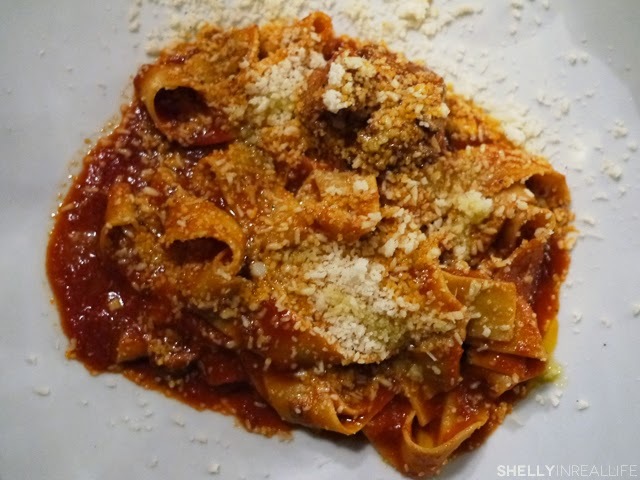 This was our first true Italian dinner to start off the trip, and the dishes at Renato e Luisa was presented with such ease and simplicity that it made us think that all Italian food in Italy was going to be this delicious. As we learned later on through the trip, not all Italian food is created with such precision, we were simply spoiled by excellence at this great restaurant. 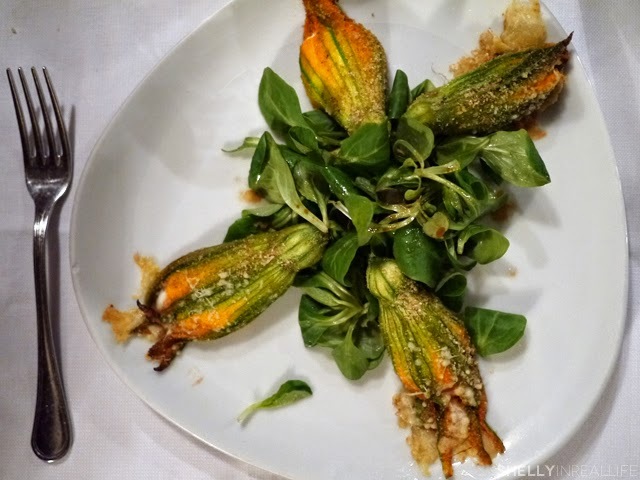 One of the staples of Rome is Stuffed Zucchini Flowers or Fiori di Zucca (€8), it's a must-have and it's made beautifully here. The beautiful blossoms are almost overstuffed with a creamy rich ricotta and delicately fried. The light salad in the middle helped cut a bit of the fattiness. It was an indulgence, but one I would gladly order again. On their special menu of the day, they offered a Fish Soup (€14) that I am going to dream about until the next time I go to Italy. This dish was the perfect balance of perfectly cooked fresh seafood and a beautifully spiced tomato broth. It rivals the one I had at Marea, a 2 Michelin Star in NYC! Through the next two weeks, I kept thinking about this dish, hoping to encounter something that could compare, but nothing did. This would be the reason why I come back to Renato e Luisa. A true example of how something so simple can still be complex. After the fish soup, I started already to feel a bit full, but J and I have major food-fomo (fear of missing out) so we always order too much. We continued the night with primo del girno, a course of 2 pasta dishes, we ordered the specials of the night. Carbonara (€14) is another classic staple of Rome so we had to order it. 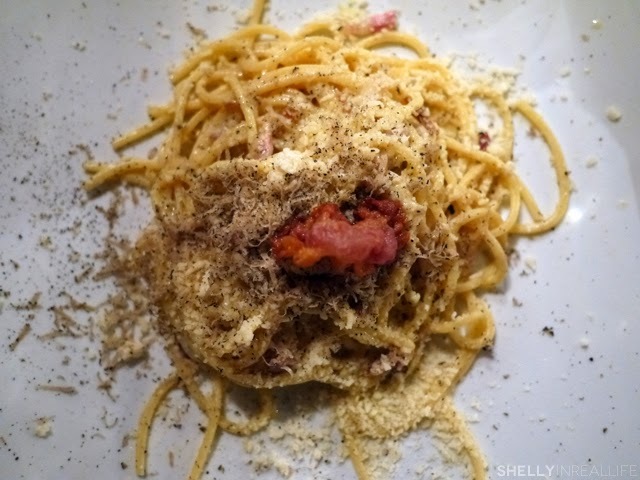 This decadent carbonara came with perfectly al dente pasta covered with cheese and black truffles shavings. Can't complain here. I'm a huge fan of all and any tomato sauces so I ordered the Lamb Ragu (€14) which came with a wonderful homemade pappardelle pasta that helped pick up all the sauce. 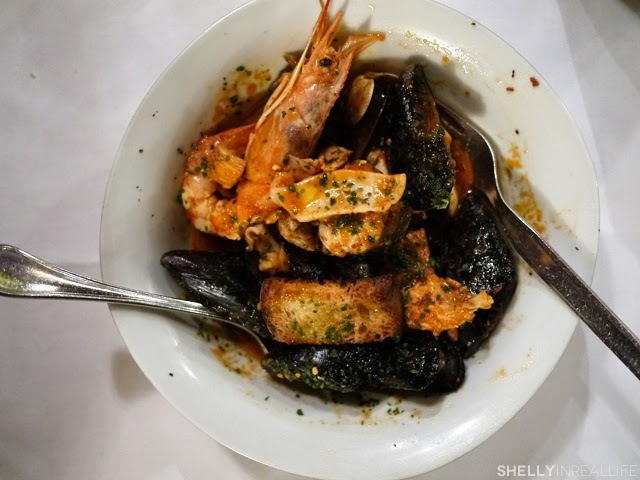 Once again, just how we envision great Italian food to taste in Italy. By the end of our pasta courses, we were already pretty stuffed, but J ordered for a secondo since we wanted to try their meat course. 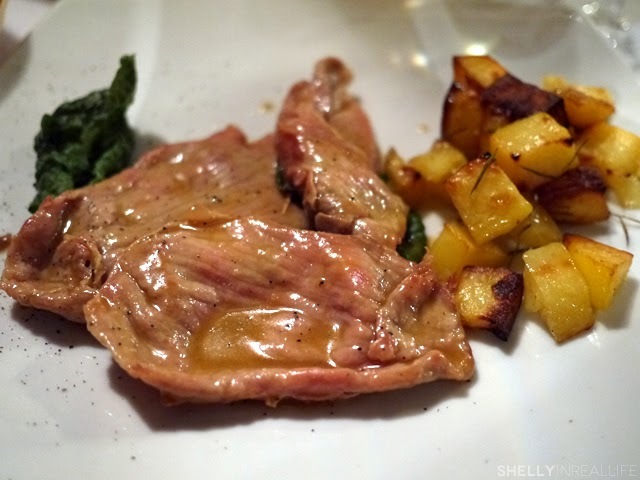 Per the waitress's recommendation, we had a veal dish that ended our night on a slightly sour note, literally. While the veal was perfectly seared, the sauce had an odd sour sauce covering it - a taste that neither J or I were accustomed to or enjoyed too much. In think if we were to do it again, we would definitely just cut this dish out, but since it was our first Italian meal, we were trying to bite off more than we could chew. Lesson learned for next time - except not really since we kept ordering way too much. Food-fomo, I'm telling you.